Heat oven to 375°F. Make and bake 36 cookies as directed on pouch for drop cookies. Cool completely, at least 1 hour. Store 16 cookies in airtight container for another use. In food processor, process half of the remaining 20 cookies to fine crumbs. Remove to medium bowl. Continue to process second half of remaining cookies to fine crumbs; add to bowl. Stir in 1/4 cup melted butter until well blended. Press very firmly on bottom and up side of pie plate. Bake 10 to 12 minutes or until crust is set in center and edges are golden brown. Cool 15 minutes. In 2-quart saucepan, mix granulated sugar and cornstarch. Gradually stir in water, 2 teaspoons lemon zest and the lemon juice until smooth. Cook and stir over medium-high heat. Heat to boiling; boil 1 minute, stirring constantly, until mixture is bubbly and thickened. Remove from heat. In small bowl, beat egg yolks with whisk. Gradually beat about 1/2 cup hot mixture into egg yolks. Gradually stir yolk mixture into hot mixture in saucepan. Cook over medium heat, stirring constantly, until mixture starts to gently boil. Cook 2 minutes longer, stirring constantly. Remove from heat; stir in 3 tablespoons butter. Pour over cooled baked crust. Cool at room temperature 15 minutes, then cover filling with plastic wrap. Refrigerate at least 3 hours until set. When ready to serve, remove plastic wrap from filling. In chilled medium bowl, beat cream cheese until smooth. Beat in remaining Topping ingredients with electric mixer on medium-high speed until stiff peaks form. Spread on top of chilled pie. Top with 1 teaspoon lemon zest. Store loosely covered in refrigerator. One medium lemon yields about 3 tablespoons juice and 2 to 3 teaspoons grated lemon zest. To quickly soften cream cheese, remove amount needed from wrapper, and place on microwavable plate; microwave uncovered on High about 10 seconds or just until softened. Want to make this dessert at the drop of a hat? Make your sugar cookies ahead, and store in a plastic zip-top bag in your freezer, so all you have to do is grind them up and go. 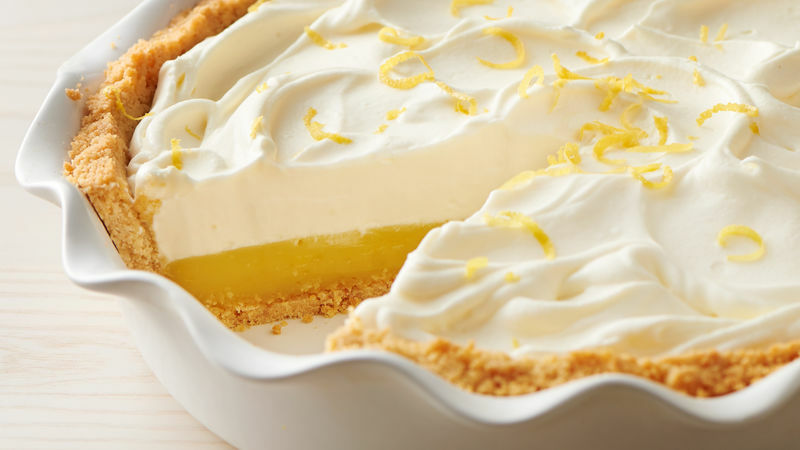 Cream cheese helps stabilize the creamy topping, so you can make this pie ahead without worrying about the topping deteriorating.